December 15th: What's On Today's Show : Blog Of The Nation In the first hour of Talk of the Nation, the Supreme Court in 2012, and listeners reflect on what was accomplished and lost in Iraq. In the second hour, Mark Kelly talks about his wife Gabby Giffords, and the top video games in the holiday season. The American flag, Iraqi flag, and the U.S. 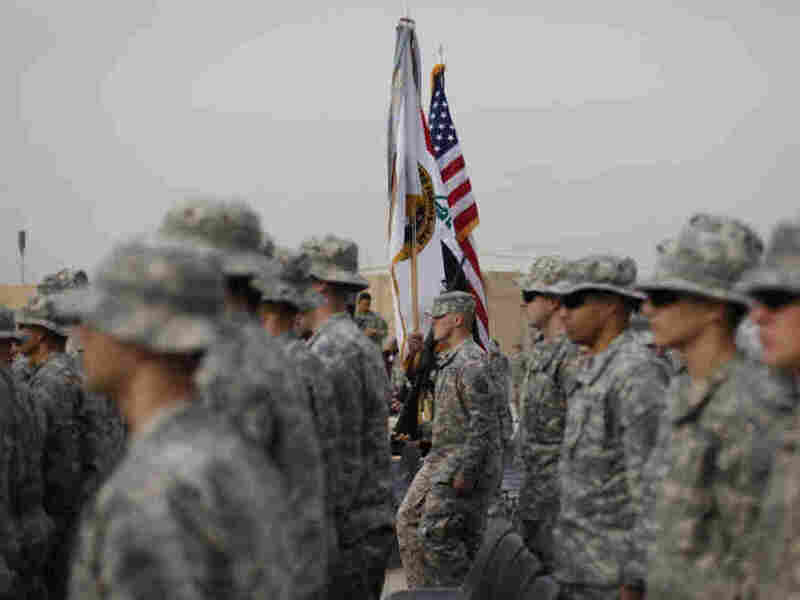 Forces Iraq colors are carried during ceremonies in Baghdad today marking the end of the U.S. military mission in Iraq. The Supreme Court faces a momentous term next year. The justices recently added two high-profile cases to its upcoming docket, agreeing to weigh in on Arizona's strict new immigration law and a Texas case involving redistricting. The justices previously agreed to hear a challenge to the Obama administration's controversial health care law. Which places the court in the center of three divisive political issues that involve the debate over the appropriate role and reach of the federal government in a presidential election year. Host Neal Conan talks with Los Angeles Times Supreme Court correspondent David Savage about the three blockbuster cases, and NPR health policy correspondent Julie Rovner joins the conversation to discuss the potential implications of the challenge to the new health care law and calls for two justices to recuse themselves. Iraq: What's Was Accomplished? What Was Lost? Secretary of Defense Leon Panetta visited Baghdad today to mark the end of the nearly nine-year long U.S. mission in Iraq. He told troops, "You will leave with great pride.... Secure in knowing that your sacrifice has helped the Iraqi people to begin a new chapter in history." Gen. Mark Dempsey, chairman of the Joint Chiefs of Staff, told the audience at Baghdad's airport, "We paid a great price here and it was a price worth paying." The full measure of the war in Iraq won't be known for years, but as the U.S. formally marks the end of the Iraq war today, many Americans reflect on what was accomplished, and what was lost. Host Neal Conan hears from listeners on the topic. When Mark Kelly and Gabrielle Giffords were dating, Gabby did most of the talking. Kelly describes her as "the most positive person I'd ever met." Their dynamic shifted dramatically last January, when a gunman shot and killed six people at a community event in Tucson and injured more than a dozen others, including Congresswoman Giffords who was shot in the head. Doctors called her recovery miraculous, but speaking is now a challenge for Giffords and Kelly does most of the talking. As Giffords continues to recover, he watches his wife face pain and frustration with remarkable courage, and hope. In their book Gabby: A Story of Courage and Hope, Kelly shares the low points, the remarkable progress and the memories that inspire them each day. Host Neal Conan talks to Kelly about their journey back from traumatic brain injury and what lies ahead. The latest Call of Duty video game racked up $1 billion in sales in just 16 days last month. That's a day faster than it took the movie Avatar to reach similar ticket sales. Video game companies typically make a mad dash to get their latest games on store shelves as the holiday season approaches. Call of Duty: Modern Warfare 3, Battlefield 3 and other first-person shooters are popular. Adventure games like Super Mario Land 3D are also in demand. Neal Conan talks with Jamin Warren of Kill Screen Magazine about the video games worth buying, and how the industry prepares for the holiday season.